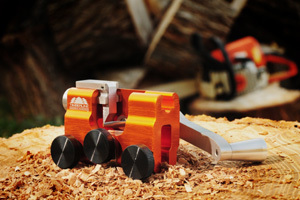 Timberline Sharpener is the portable precise tool that works on any chainsaw. The key to the tool is a solid platform that won’t bend, flex, or otherwise move during sharpening. This acts as a fixed guide to sharpen each cutting tooth to the same length, height, and angle. Professional loggers and arborists as well as occasional chainsaw users are amazed by the cutting performance after they’ve sharpened their saws with the tool. It really creates an excellent/near perfect cutting edge that’s reviewed to cut better than new. Carbides are available in all common sizes: 5/32” 3/16” 13/64” and 7/32” and are interchangeable with the tools. They last a minimum of 40+ sharpenings. Angles are set at the standard 30˚ with accessory angle guides available. 25˚ – durable cutting edge, ideal for hard or dirty wood. 35˚ – steeper angle cuts faster in soft, dry wood.